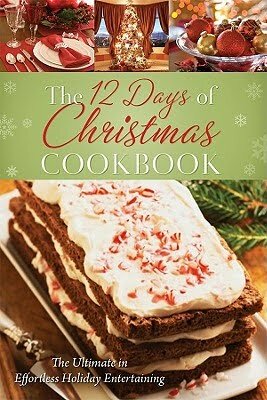 The 12 Days of Christmas Cookbook is pretty. Very pretty. It has been beautifully presented in a hardback, glossy package with raised lettering. For a gift/cookbook, this is tops. The presentation is, quite simply, lovely. When I saw the title come through Barbour Publishing's new releases, I was definitely interested in checking it out and sharing it with you all! As I said, the recipes are all straight forward and the ingredients familiar throughout the book. One particular note about this book is that it assumes the cook will take the shortcut of adding ready-made ingredients to the dishes. (For example, some of the soups and breads assume that you will start with some canned good of varied types.) I rather appreciate that because I dislike when I read, "vegetable stock" in a recipe and then read "go to page X for recipe." I like baking and cooking, but I do appreciate the shortcuts and typically use canned and prepared foods as I'm putting things together. I most especially do that when I'm cooking for 40+ people so I find this book to be particularly useful and full of great promise as far as I am concerned! There are also lovely photographs scattered liberally throughout so that you can always tell when you've succeed (or not) with any given recipe! It's fun. It's festive. It's yummy. THIS CONTEST IS NOW CLOSED. THE WINNER (as selected by Random.org) IS #20 - Stephanie's Mommy Brain! Congrats, Stephanie! Happy Thanksgiving AND Merry Christmas to you all! I love cooking; any kind of cookbook is wonderful to me. And this one looks really good! Thanks for the chance to win it! Looks like a great cookbook ... I would love to add it to my collection (or give it to my mom to add to her extensive collection of cookbooks). Thanks for sharing (I might have to find it on my own). I love to cook, especially baking, this looks like such a great resource. I LOVE to bake (and eat, unfortunately!) !!! Sign me up! I am not in love with cooking, that is for sure, so every bit of help is needed for me to stay motivated. This book sounds like it could help add that bit of motivation. Looks like a wonderful way to get in the Christmas spirit! I would love to win! Lovely, Christmas and workable...sounds like a good combination to me! Hope you have lots of fun trying new recipes. Hmm...I wonder if I would keep this or give it as a gift? It looks absolutely delightful, but I definitely like the shortcuts. How often do you cook for 40 people? Where do they all sit?? Reading cookbooks is just as fun as a novel sometimes! I'd love to win. Christmas is about the only time I like to cook. Once a year, I like to go all out, and bake the things my mom used to make. I have been collecting cookbooks since I was 14. I would love to add this to my collection. Christmas cookbooks are my favorite. Count me in! I love cookbooks that are creative or connected with holidays. This looks like a fun one. Sounds like a fabulous cookbook. Thanks for offering this giveaway. Please enter me in the giveaway. I love to cook, and especially to bake. I LOVE cookbooks, and this one looks lovely! Please do enter me..
By the way, I just added you to my blog list and am following you on Google friends. Terrific blog! I love to cook and I especially love finding new holiday favorites. Count me in! I would love to win a copy of this. It looks absolutely lovely. I really enjoy your blog. I have requested a number of books from the library based on your reviews! Keep up the great work! I'd love to win this for my two daughters. Sounds like a fun book. I love cookbooks and cooking from them.